You have found Geek Hill, the residence and home offices of two legally married geeks, nerds if you will, call us computer nerds if you like, but keep one thing in mind: the twenty first century is the age of the geeks. Suddenly geekness is not a social affliction, it is a marketable skill, a reliable means of earning an income. In the 21st Century geeks are in high demand. For years it was not fashionable to be a geek. Geeks were tormented in school, chosen last for pickup games of sports, and subjected to taunting and ridicule. Now despite never having been high school jocks the Geeks are living on the top of the hill. What seemed like a curse many years ago has turned out to be a real advantage. Access to Geek Hill is controlled by an electrically operated remote control security gate. The Geeks and a few other authorized parties have radio transmitters that send a special Geek Access Code used to open the driveway gate. For visitors a Geek Notification Button on a column near the gate sends a special Geek Alert tone to the main residence, where it is possible someone might hear it. 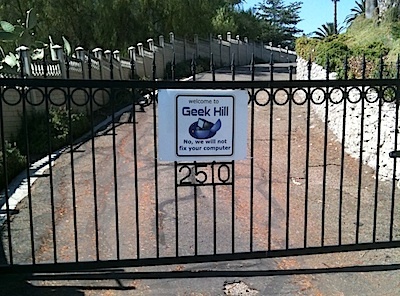 Should you be invited to visit Geek Hill please be prepared to answer a few questions before the Geek Hill Gate is opened and you are granted access. No worries if you do not know the answers to all three questions, just name the source of the questions and you are right in! As you might expect from a home at the top of a hill, Geek Hill offers some fantastic views of the area of Southern California known as the Inland Empire. Geek one is an amateur photographer, and he likes to set up a camera on a tripod and take long exposure photos looking out at the amazing views. Take a look at the View album to see some of the shots. See more photos taken at Geek Hill by visiting the Geek Hill Gallery at Steve's Photos. The massive Geek Hill solar power project is now completely finished. Southern California Edison has blessed our installation and we are now official wholesale power producers (Geek Hill Electric) All 78 solar panels and their individual inverters have worked as designed since day 1. Some panels are on the south side of the main house roof, more are on the carport, screened patio, guest apartment, and garage. As of September 2016, Geek Hill Electric has already produced over 130 Megawatt hours of power Current Output Photos. For our 2014 and 2015 annual net-metering accounting we were net producers of electricity and received a check from SoCalEd. Just a note so you don't miss it, the Geek Hill Gallery at Steve's Photos includes hundreds of photos of all different kinds taken at Geek Hill, including our new electric car. See the view of Interstate 15 from Geek Hill, updated about once per minute, using our Orange Pi I-15 cam, with weather details too. The Geek Hill Gallery at Steve's Photos features hundreds of photos taken at Geek Hill. You'll see tomatoes, hawks, hummingbirds and flowers and it's all 100% geek. Skeptic Hosting is the pro bono operation of geek number one, providing a web hosting environment for sites that promote a reality based lifestyle choice as an alternative to the fictions of dogma and woo. This domain is hosted on a Skeptic Hosting server. Copyright (c) 2012 Skeptic Hosting. All rights reserved. Layout by Free CSS Templates.